Velakali is a ritual art form performed from the temple courtyards. This is a martial folk dance and is spectacular to view the dance steps. Earlier it was the men from the Nair community who performed this dance but now people from other communities also perform this. The Nair were the warriors of the olden times. The dancers wear dresses similar to that of a soldier and holds colorful swords and shields. Instead of swords canes are also used at times. A martial music is accompanied during which the dancers take war like steps. About 50 artists go in a line and in between they display some fighting steps by coming out of the line. The Velakali includes war like movements, sword play etc. It requires proper training for one to perform this dance. The musical instruments used in this dance form include Thavil, Suddha Maddalam, Elathaalam, Horns, Chenda and Trumpets. The Velakali is performed when the deity is taken out for the procession. It is called as the Thirumumbil Vela which means performing in front of the deity. This is usually performed from the temple courtyard, if it is conducted from the premises of the temple pond it is called as Kulathilvela. The dancers wear a head dress which is in the shape of a cone that points to one side. Their chest is covered with garlands and beads and they wear a waistband. They also use the armlets. In certain areas the dancers use mask of tigers and other animals and are called as Velamudikaars. They provide some entertainment to the spectators. This play is believed to refer to the war between the Kauravas and the Pandavas or the Deva and Asura war. 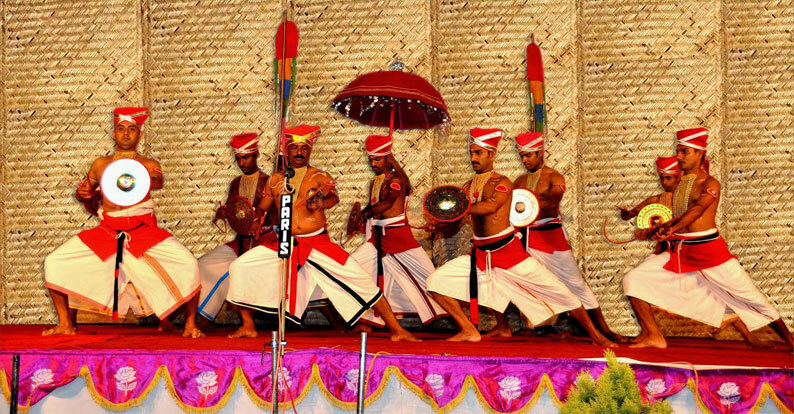 A local ruler called as Mathur Panicker was responsible for the formation of this dance form. This dance form is common in the Alappuzha district where the annual performance of Velakali is conducted from the Ambalappuzha Sri Krishna Temple.